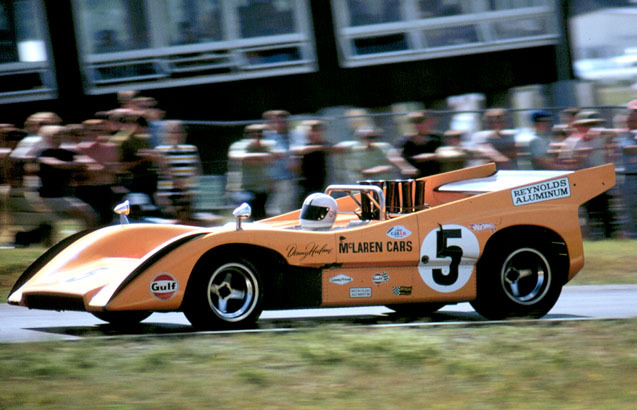 Today sadly marks the 40th Anniversary of Bruce McLaren’s unexpected death whilst testing one of his newest Can Am creations at the Goodwood circuit, as reportedly the rear bodywork became loose, allowing air underneath it, unexpectedly taking away the hurtling racecar’s Downforce and pitching Bruce into an uncontrollable spin, sending him careening into a bunker used as a Flag station! So I guess it’s somewhat funny that I almost always think of the Auckland native as a Can Am racer first ‘N foremost, since he actually first rose to prominence as a Formula 1 Driver, notably after astounding the F1 Circus with a brilliant First-in-Class F2 placing and fifth overall in the 1958 Nurburgring Grand Prix where the field was comprised of both Formula One and Formula Two entries. Then Bruce was invited to partner “Sir Blackjack,” nee Triple Formula 1 World Champion Jack Brabham at Cooper way back in 1959, where he toiled as a “Works” Driver for seven years before ultimately finishing his career at the wheel of his own enterprise known as Bruce McLaren Motor Racing Ltd.
As interestingly, the only time I’ve ever seen this most magnificent pearlescent black No. 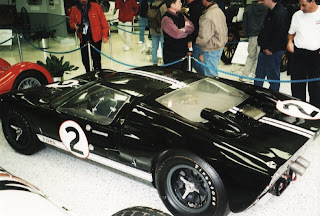 2 1966 Ford GT40 Mk II was at the Indianapolis Motor Speedway’s Hall of Fame Museum during the 2001 USGP weekend. And I suppose it’s not relevant, but I think the last time I saw one of Bruce’s creations was a fleeting seven years ago out at the SOVREN (“Hysterical’s”) Historics where the ground shaking orange monsters are always one of the crowd favourites along with the Vintage Trans Am ‘Boyz during our most excellent yearly Fourth ‘O July SOVREN Vintage Races held at Pacific Raceways in Kent, Washington. 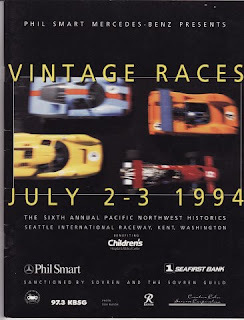 As it was during this event that I stood in line to get a very stodgy Cat named ‘Rufuses John Hancock,” who was begrudgingly signing autographs in conjunction with it being the 40th Anniversary of his lone Indy 500 win; can you say Parnelli Jones? Yet my best McLaren memory is of some Dude named “Hollywood” deciding to let the Red Mist get the better of him and crumple up one of his then Employer Bruce McCaw’s vintage McLaren racing cars... As Y’all may recall? Bruce McCaw was one of the four McCaw Brothers whose McCaw Cellular business was sold to AT&T the first time they went into the cell phone business, back in the early 1990’s... As Bruce Was the co-owner of our then-local PacWest Racing Team, while afterwards I hunted down Mr. Hollywood, a.k.a Danny Sullivan traipsing his way back to the pits... As ‘Sully, still in Driving suit asked to sign kid’s autograph request’s first... But then as he put his hand on my back while signing my Molson Indy poster told me: “I think I’ve signed EVERY one of these posters they made...” As there was only supposed to be a limited number autographed! Meanwhile for a longtime now, there have been reports that a movie’s being made about (The Almighty) Bruce’s life, as there’s even an official movie website, click here. great post. shame the local NZ media doesnt bother reporting the 40th anniversary of his death.